Expression Shalom Aleichem according to Hebrew dictionary means "peace be upon you". When Jews meet they say greeting to each other "Shalom Aleichem". The respond is "Aleichem Shalom”, what means upon you be peace. Many composers wrote different melodies for Shalom Aleichem. Some of them fast, some of them slow. On May, 1918 The Rabbi Israel Goldfarb composed a slow version for the Shalom Aleichem. that when people are returning from synagogue on Friday night 2 angles are following them – Good one and Evil one. 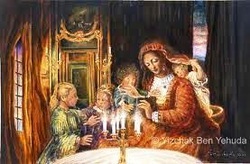 If the house prepared for Shabbat – Lamp has been lit, the table set and his couch spread then good angel blessing the house and said that the next Shabbat will be the same. Evil angel forced to say “Amen”. If the home is not prepared for Shabbat then evil angel expressed that the next Shabbat will be the same and a good angel forced to say “Amen”. This song became universal. It’s a custom before to sing Shalom Aleichem on Friday night before Kiddush.